Set amidst Cypress trees on the edge of Australia’s Mornington Peninsula golf course – on Victoria’s southern tip – the Links Courtyard House is the latest single-storey holiday home by Inarc Architects. Set within an aspect that combines the links golf course, a gravel road leading up to the property and the area’s rugged coastline, the development is a peaceful retreat, built to house the clients’ busy family life. The design was conceived to reflect the calmness and beauty of the location. The project’s geometry is simple. 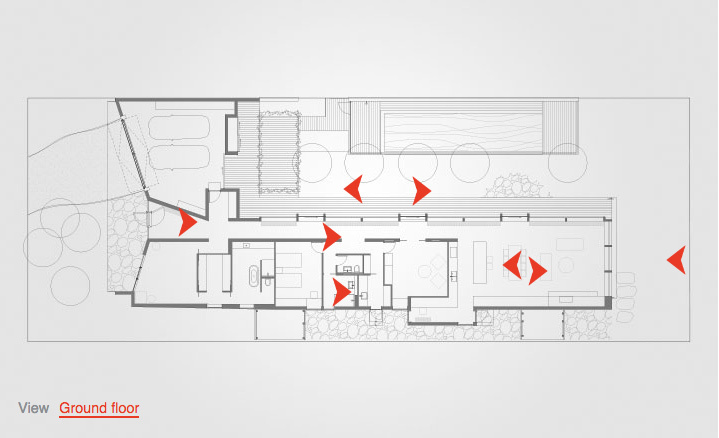 A rectilinear plan contains the house’s key spaces, clearly defining the built area; its low profile makes the landscape around it the real focus. Strong vertical structural elements on the facade give the building a sense of rhythm, as well as providing sun shading and a useable intermediary space between house and garden. The building’s size may be modest, but it’s the quality of space and attention to detail that make it stand out. Inarc director Reno Rizzo’s aim was to keep the palette of materials to an absolute minimum in order to contribute to the surroundings but not to dominate them. The single-storey plan allows sunshine to penetrate deep into the garden and minimise overshadowing. The house’s open plan includes a single living/dining/kitchen space. There are two separate small bedrooms and a double garage. When it comes to views out, the house takes full advantage of the nearby golf course, as the main living areas are orientated so as to frame the vistas towards it. In contrast to the simple palette of the sport grounds, the landscaping of the house’s own courtyard features a rich variety of colours and textures. The property remains unfenced, to encourage the family to stroll down the low-key coastal gravel road alongside it. One of Rizzo’s aims was to keep the site as open to its environment as possible – to create a meaningful dialogue between private spaces and the surrounding nature.